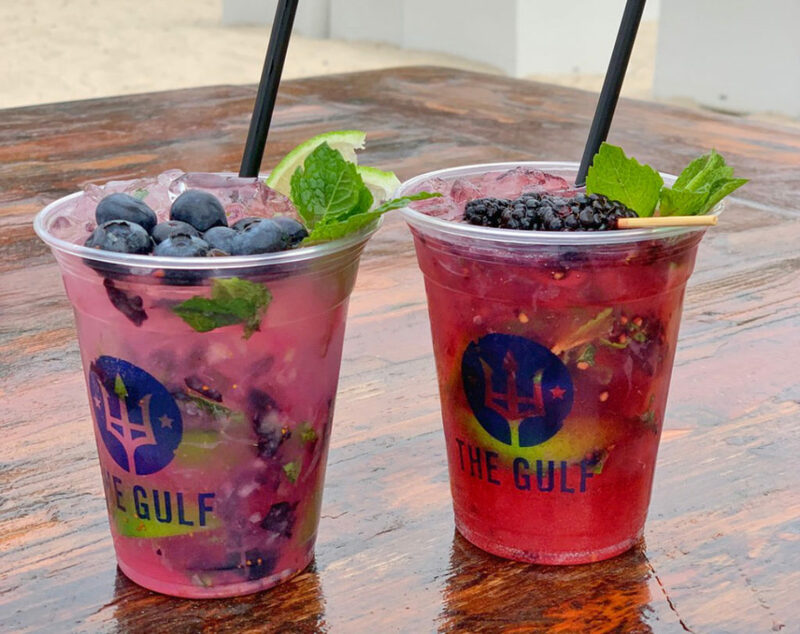 Seasonal fruits keep mojitos fresh all year long at The Gulf in Orange Beach, Alabama. It all started with kumquats. Victor Bobu, bar manager at The Gulf restaurant and bar in Orange Beach, Alabama, always mixed regular mojitos for his customers, a Cuban drink made with rum and muddled mint. But when a local resident brought him kumquats he decided to do something different. He created a kumquat mojito. The experience got him thinking. The restaurant used fresh berries in its desserts so he wondered if berry mojitos might be the next step. After all, fresh kumquats aren’t in season that long, neither are berries, so a seasonal mojito seemed like the perfect move; rotating fruit for the drink might keep the fruit mojito in business all year long. “And it went crazy from there,” Bobu said. Bobu now serves 35,000 mojitos each year at The Gulf, and the drink’s ingredients always depend on what’s in season, he said. His fruit drinks include the required fresh mint, Bacardi rum and whatever’s fresh at the market, which has included strawberries, blueberries, raspberries and blackberries. And each drink is created new. “There’s nothing out of the bottle,” he said. Except for the alcohol, of course, which means Bacardi. It’s a fitting cocktail for The Gulf, a unique casual complex created from 28 renovated ship containers that includes a bar, restaurant and gift shop with lots of outdoor seating all facing the warm waters of the Gulf of Mexico. In addition to the Orange Beach location, there’s one on Okaloosa Island in Florida. Both daily drink specials and the food menu are posted on a chalk board, changing up regularly. The restaurant serves Gulf-caught seafood, raw items such as oysters and regional produce, keeping with the farm-to-table objectives. “Our food menu changes every day or almost every day,” Bobu said. And if you think visiting The Gulf to enjoy a refreshing mojito and fish sandwich while gazing out on to the emerald waters and feeling the sultry sun bask your face sounds nice, think of how it would be to work there. Directions: In the mixing glass, combine the blueberries, mint leaves and limes, reserving a few of each for garnishes. Add the sugar cane simple syrup and muddle the mixture. Add a scoop of ice and the rum and give it a couple good shakes. Add the club soda to the mix, pour into a cocktail glass and garnish with the leftover fresh berries, a lime wedge and a few mint leaves.